Want to up your soup game? 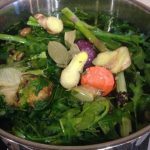 Make your own Homemade Vegetable Stock - easy and MUCH better than store-bought stock. additional vegetables may have on hand mushrooms, kale, spinach, beet tops, etc. Gather all the ingredients. Wash the vegetables, just scrub them well. No need to peel anything as you will strain it at the end. In a large stock pot over medium high heat add all of the vegetables. Add water to cover, usually three to four quarts. Cover tightly with a lid and bring it to a boil. Once it reaches a boil, reduce the heat to low and simmer loosely covered for four hours. You may need to add more water, just keep an eye on it. After four hours turn the stove off and allow the pot to cool. Once cool, strain out the vegetables and discard. I recommend storing the stock in four cup containers (I use pickle jars) and freeze until you're ready to use.